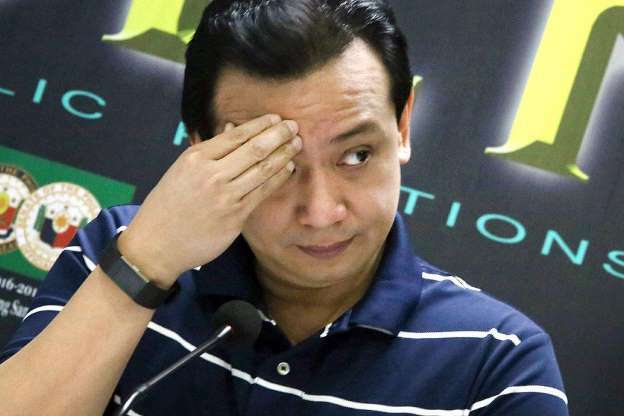 MANILA – Chief Presidential Legal Counsel Salvador Panelo on Friday said opposition Senator Antonio Trillanes IV is just hallucinating for claiming his life is now in danger. “To be clear, his supposed arbitrary arrest, and now threat to his life, are but figments of his imagination,” Panelo said in a statement. Panelo slammed Trillanes for continuously seeking refuge in the Senate despite assurance from President Rodrigo Duterte the senator will not be arrested without a warrant issued by the court. “Noticing, however, that his supposed arbitrary arrest drama is losing media traction, Senator Trillanes is now claiming that his life is in danger by releasing a supposed video footage showing that an unidentified vehicle is casing his house,” Panelo said. Panelo added that there has never been any concrete report showing any attempt against Trillanes’ life. “These are all publicity stunts of Senator Trillanes not only to besmirch the reputation of the President but also to milk publicity for himself,” he said. He challenged the senator to take legal action if the latter believes there is no basis for his arrest. Panelo said Trillanes should stop acting like “an anxious puppy pretending to be a political target by the President all the time”. On Aug. 31, Duterte issued Proclamation 572 declaring void ab initio (from the beginning) the former Navy officer’s amnesty over his failure to comply with mandatory requirements. Trillanes reportedly has no application for amnesty and did not admit his guilt for the crimes of rebellion he committed against former president Gloria Macapagal-Arroyo. Trillanes tried to stop the implementation of the proclamation and his arrest but the Supreme Court denied his petition. Despite the SC’s ruling, Duterte decided to wait for the Makati Regional Trial Court which has jurisdiction whether to grant government’s plea for alias arrest warrant against Trillanes. Panelo later found out that Trillanes’ amnesty was not actually approved by former president Benigno Aquino III but by former Defense secretary Voltaire Gazmin.